George Graham Reviews Marcia Ball's "Peace, Love & BBQ"
Boogie-woogie piano in the Gulf-Coast and New Orleans style is generally considered a "guy thing," but there are some talented women who are among the top in the genre, among them Ann Rabson, Deanna Bogart, and perhaps the best-known Marcia Ball. 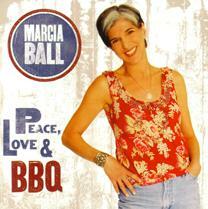 Ms. Ball has just released her approximately 11th album called Peace, Love & BBQ. Born in 1949, Marcia Ball grew up in the Gulf-Coast border region between Texas and Louisiana, the product of a family all of whose female members played piano. She took piano lessons starting at age 5, and played songs from her grandmother's collection of Tin Pan Alley songs, and from her aunt, some more modern popular songs -- this was the 1950s. But it was in 1962 when she heard New Orleans singer Irma Thomas that she discovered the blues. Ms. Ball describes being "totally blown away" by Ms. Thomas, and when Ms. Ball began playing in a band, they did Irma Thomas material. She played gigs while attending Louisiana State University in 1966 with a group called Gum. In 1970, she was on her way to settle in San Francisco when her car broke down in Austin, Texas, and while waiting for it to be fixed, she decided she liked the town enough to stay there, and she has been part of the music scene in Austin since. But she draws on large helpings of New Orleans influence, including Cajun, Zydeco, and the boogie-woogie piano style that is the trademark of the Crescent City. Over the years, she has been developing an ever-wider reputation, getting national media attention, and recording a popular joint album with Angela Strehli and Lou Ann Barton. Interestingly, after she was signed to Capitol Records in the mid 1970s, her first album was in the country mode. She's an impressive pianist, and singer-songwriter, and like most blues artists, she tours incessantly. Her last release, in 2005 was a concert recording called Live! Down the Road. Peace Love and BBQ is her first new studio album in five years. It turns out to be a gem, with a fine collection of mostly original songs backed by her tasteful regular band, and also including some guest appearances by such people as Dr. John and Tracy Nelson, along with Zydeco musicians Terence Simien and Wayne Toups. The album more or less alternates between upbeat tracks and slower ballads, and she has something to offer in both respects, including a couple of original songs that revolve around hurricane Katrina. In addition to the guests, she appears with her regular band with Don Bennett on bass, Corey Keller on drums, Mike Keller on guitar, and Thad Scott on sax. The CD was recorded in Austin and produced by veteran producer and multi-instrumentalist Steven Bruton. Marcia Ball's new CD Peace, Love and BBQ is one of her best recordings, with every track having something worthwhile to offer. Ms. Ball gives us a good helping of her impressive piano work, bluesy vocals and astute songwriting. The production by Steven Bruton was excellent -- often featuring larger groups with horns, but always being tasteful and never overbearing. Her songs run the gamut from the suffering and displacement of Hurricane Katrina to unabashed party music. The numerous musical guests provide some interest, but don't distract attention from the musical matters at hand. I have no real complaints about the CD's sound quality. I would not exactly call it an audiophile recording, but the mix is good and the sound clean. Dynamic range, the treatment of loud and soft, is passable, mainly because there is not a lot of subtlety of the dynamics to this music. Through a thirty-year recording career Marcia Ball has been making enjoyable music steeped in her Gulf-Coast stomping ground. Her new CD is a definitely a highlight of that career.